Star Clippers is offering a twelve night Grand Voyage from Lisbon to Barcelona in 2016. Departing April 25th, the Star Flyer will carry 170 guests to eleven eclectic ports in the Mediterranean. Known as ‘the cup of silver,' an ancient port almost African in appearance, the streets of Cadiz are lined with palm trees and churches topped with dome-like cupolas. Return visitors to Cadiz talk fondly of the food being the freshest seafood in Spain. Try the plump oysters and tiny shrimp sold on the market’s outskirts with a crisp glass of sherry, crispy churros sprinkled with a pinch of salt, or share Spanish tapas in one of the many rowdy taverns. Stroll the narrow shaded streets with an agua de coco (coconut water) and uncover Cartagena’s Roman remains, Modernist houses made by the pupils of Gaudi and military fortresses. Bathe in El Totumo, a mud bath with alleged healing powers. According to folklore, the volcano used to spew lava but was turned into mud by a local priest who believed it was the work of the Devil, and banished him by sprinkling holy water into it. Tangier, the gateway to Africa and model for the film ’Casablanca’, has a nest of medieval alleyways to explore. Tour the medina (old quarter) and Kasbah (old fortress) and splurge at a typical bazaar. Feast on an authentic Moroccan lunch with couscous and tagine, and sample traditional mint tea at a tea bar. ‘The Cave of Hercules,’ long thought to be bottomless and to have sheltered Hercules overnight provides views of the Atlantic, and is the perfect excuse for a camel ride. Unfinished gothic cathedrals, traditional balconied buildings and an 11th-century Gibralfaro castle on top of a hill - this is Malaga, Pablo Picasso’s birthplace. Relax at beachside bars, taverns and bistros and the Paseo del Parque along the harbour, shaded by palm trees and adorned with fountains and Roman sculptures. Unwind back onboard the ship in your deluxe suite serving as your own peaceful haven, or join other guests at the indoor-outdoor Tropical Bar for a drink and seafood buffet. You feel like you are on your own private yacht aboard Star Clippers with its two swimming pools, 1760 square metres of open deck and hidden balconies on either side of the bow, you’re sure to find your own secret hideaway. 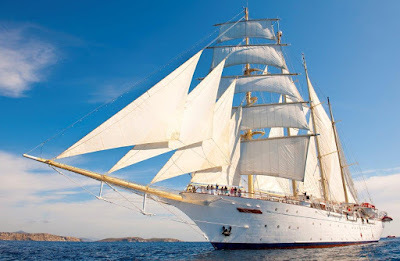 Star Clippers’ Grand Voyage from Lisbon to Barcelona starts from $3,659pp including taxes, grats and the applicable 35% early booking discount per person sharing a twin cabin, departing 25 April 2016.